Last Thursday we travelled to Thetford, Norfolk, the first destination of City As Material 2, centered on the theme of ‘Migrations’. Joining us were Andrew Hunter and Lisa Hirmer from Dodolab, Josie Mills from the University of Lethbridge Art Gallery, and Leila Armstrong. 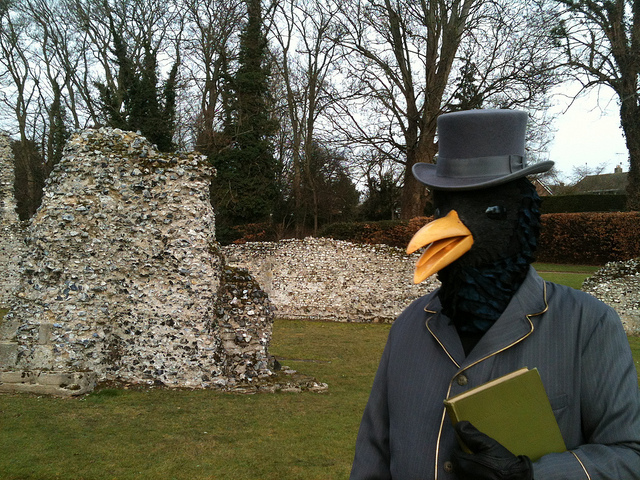 Oh, and the “itinerant avian scholar” (in his own squawks), Professor William Starling – Andrew’s alter ego, who is investigating the decline of Starlings and other species in the UK. After a heinous early start and a couple of train changes, Giles and I were picked up by Andrew in Bury St Edmunds, a short drive from Thetford. He filled us in on what they’d been up to so far, and we started to discuss a loose route for the day. We arrived and worked our way into the town, along its contours of winding roads and down the High Street, where people drifted past in the slow, content manner of those living in a quiet market town on a warm Winter’s morning, then met the others in a Portuguese cafe. The 2001 UK census suggested that almost 30 % percent of the population in Thetford were Portuguese, drawn by work in the farms, fields and factories. Andrew showed us an aging tome entitled ‘In Breckland Wilds’, which Professor Starling had been studying to get a sense of the area in past times. I immediately turned to the alluring chapter called ‘Traditions, Customs and Ghost Tales’, and learnt about the spectre of the “flaming-eyed rabbit” and other dubious local lore. Smirking aside, there was a genuine interest in Thetford’s folklore – tales that can allude to the real fears and anxieties of people in the area at the time. 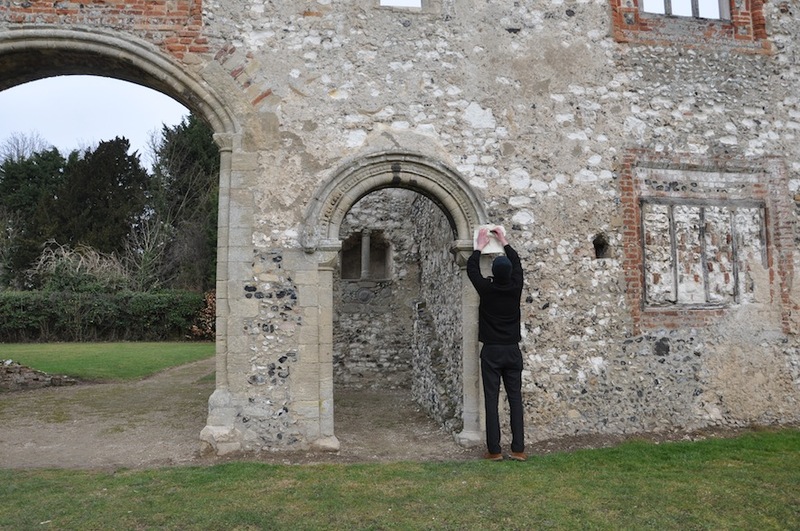 On that note we departed and headed for the ruins of Thetford Priory, which in the 13th century had drawn pilgrims to Thetford, after the discovery of a number of saints’ relics in a statue of the Virgin Mary. Along the way, Andrew transformed into Professor Starling, donning grand attire and a giant bird’s head (crowned by a top hat) and spotted one of his namesake in a tree. Unfortunately it would be the only one we spotted that day. He chatted with passing locals who weren’t fazed in the slightest, cheerfully greeting our unusual ensemble. I was expecting the ruins to be scattered rubble, but the crumbled perimeter walls were still visible, laid out in thick lines of fist-sized flint, two feet tall. It almost looked as if it was in the process of being built; the stonemasons away on an eternal break. I made some rubbings with tracing paper and a graphite block, gleaning traces of the past, and noticed covered grill pits, sadly filled with rubbish – traces of the now. Saying that, despite being a marvel for us, these ruins must seem very commonplace for the local youth. We split up after returning to the city centre. Professor Starling and Lisa went to talk to more people on the high street, Josie and Leila set off for Ancient House Museum, and Giles and I took a scenic detour around the town edges, observing lovely flint cottages and houses overtaken by vivid green vines, then slowly passing along the river. 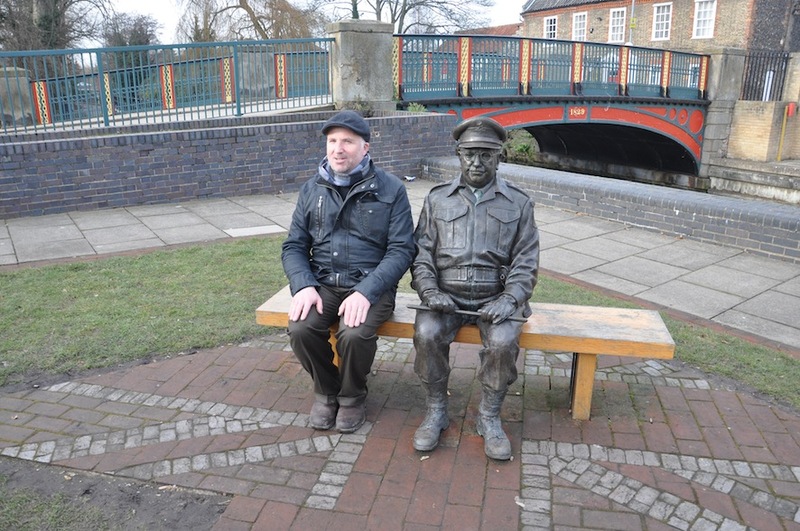 We noticed statues of Captain Mainwaring from Dad’s Army, which was filmed extensively around the area, and by contrast, one of Maharajah Duleep Singh, who settled in the nearby Elveden Hall, on the opposite bank. There’s also an odd statue of Thomas Paine, born in Thetford, on King Street, poised with quill as if playing darts and gripping an upside down copy of his book ‘The Rights of Man’. A diverse trio indeed. Reuniting with Josie and Leila briefly at the Museum, we saw a Narwhal tusk, taxidermy birds, and replicas of the Thetford Hoard, unearthed in 1979, and now housed in the British Museum. The circumstances surrounding the discovery are shady and it is thought the treasure is incomplete. We started to think about what might be missing, and what the treasures of Thetford today might be. Over lunch, everyone together again, Andrew recounted some of the opinions he had gathered as Professor Starling. His favourite, in response to his question about why the numbers of Starlings had fallen in Thetford was “Cats!”. Following chuckles, we left for Castle Hill, one of the tallest Norman mottes in England, although nothing remains of the castle which once sat atop it. There seems to be many rumours about buried treasure and hidden tunnels, though our only surprise was how tricky it was to safely walk back down. Lastly, we drove out to the remains of the Thetford Warren Lodge, surrounded by wonderfully spongy ground that felt like it was absorbing you into the land, and paths sprinkled with knapped flint. Peering through the bars which protected it gave a sense of the original fortitude and seclusion of the structure, standing firm amongst thickets of trees. Tranquil as it was, we had another agenda: to drive back to town, and retire to the Bell Inn. Pints up! I wonder why you thought the statue of Thomas Paine odd?